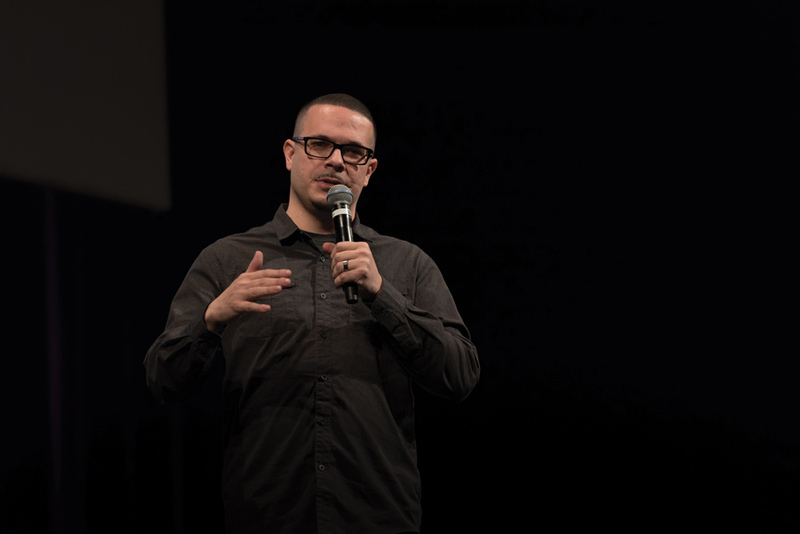 Shaun King speaks at The State of the Black Union event on Thursday in Cahn Auditorium. King discussed police brutality and Donald Trump’s rise to power on the back of white supremacy. Social justice writer Shaun King said while some people think humanity is advancing, society still confronts many of the same racial challenges it faced decades ago. “It grieves my soul that the things I was protesting literally 20 years ago as an undergraduate student could be cut and pasted into our headlines today,” King said at an event Thursday in Cahn Auditorium. Speaking to about 600 people, King shared his views on the inconsistency of progress and the prevalence of police brutality in the U.S. For Members Only, Northwestern’s black student alliance, hosted King at its State of the Black Union, in honor of the 50th anniversary of the Bursar’s Office takeover. The activist pointed to the war on drugs and the roughly two million incarcerated people in the U.S. as evidence for society’s lack of progress. He also said President Donald Trump capitalized on existing white supremacy to win his election. King maintains a large social media presence that he uses to highlight instances of police brutality and other social injustices. People often refer to him as the voice of the Black Lives Matter movement, a title he refutes because he said the group has no single leader. King compared the cases of Eric Garner, Trayvon Martin and Tamir Rice — unarmed black men who died at the hands of police — to lynchings from the 1950s. He said, however, there are more instances of police brutality than those three cases. He added that the legal system often doesn’t provide justice for victims, leading people to believe the judicial system is broken. For example, King said, the war on drugs was established to disguise the continued oppression of minority communities. “In the way he described (history) it made me realize we make the same mistakes because we don’t look back on history and learn from it,” Tsegai said. FMO president Kasey Brown told The Daily it was important to bring the “controversial” figure to campus not only for the black community — to which the event caters — but also for the larger public. The Weinberg senior said all people should remember the injustices that exist today. “All of us need to come together to understand the black voices and understand the black struggle in order for us to progress,” Brown said.